Astronauts aboard NASA?s space shuttle Discovery scannedtheir spacecraft?s heat shield for any signs of damage on Tuesday, but couldn?tbeam the results to Mission Control because of a main antenna dish malfunction. The antenna failed to work just after Discoverylaunched Monday on a delivery mission to the International Space Station. Withoutthe antenna, Discovery?s seven astronauts can?t send or receive big datapackages, like beaming live video to Mission Control or receiving majorrevisions to their flight plan. ?We can?t talk through it. We can?t send commands throughit. Really nothing works with it at this point,? shuttle flight directorRichard Jones said in a Tuesday morning briefing. That meant Discovery?s astronauts had to record theresults of their shuttle inspection on 40-minute data tapes instead of beamingvideo and laser camera data straight to Mission Control. They had to use six tapes to store about 40 gigabytes of data from the inspection sothat it can be sent to Earth later once Discovery reaches the space station [Discovery?spre-dawn launch]. The astronauts used a 100-foot (30-meter) inspection boomtipped with laser sensors to scan the heat shield panels along Discovery?s wingedges and nose cap for any damage sustained during their Monday launch. ?Thesurvey took hours. ?It?s a long day so we actually rotate through,? said shuttlepilot Jim Dutton, one of three Discovery astronauts who performed the scan, ina NASA interview. 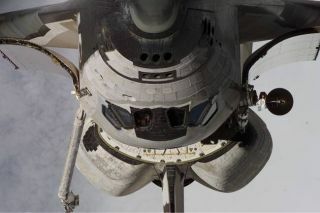 The inspection is a standard part of every space shuttlemission since the 2003 Columbia disaster, where wing heat shield damage ledto the loss of the spacecraft during re-entry. Seven astronauts were killed. Since then, NASA has developed rigorous inspectiontechniques and repair methods to ensure heat shield integrity of its shuttlesin flight. Tuesday?s inspection is the first of three planned surveys of theshuttle by its crew and astronauts on the space station. Discovery is due to dock at the International SpaceStation Wednesday morning at 3:44 a.m. EDT (0744 GMT). The astronauts areworking on a skewed schedule that requires them to sleep in the day and work atnight. They?ll go to sleep at about 12:21 p.m. EDT (1621 GMT) today to rest upahead of Wednesday?s docking. The malfunctioning Ku-band antenna dish is 3 feet (1meter) wide and about 7 feet (2.1 meters) long. It is one of severalcommunication systems on Discovery, which also has UHF and S-band systems forvoice and data transmission, but only the Ku-band system can send home video. Without the antenna, Discovery?s rendezvous with thespace station is expected to be a bit trickier, since the device is also usedin a radar mode to give shuttle commander Alan Poindexter updates on Discovery?sapproach and alignment. Jones said the astronauts can use star trackers and otherdevices in place of the antenna?s radar. Jones said that the antenna is tracking communicationssatellites in orbit, just not sending or receiving information. A similarantenna failure occurred during NASA?s STS-92shuttle mission to the space station in 2000, he added. It is unclear if the antenna can be repaired duringDiscovery?s 13-day mission. But so far, the glitch has not posed too much of aproblem for Discovery?s crew or flight controllers on Earth, Jones said. ?I would characterize it right now as a minorinconvenience,? Jones said. SPACE.comis providing complete coverage of Discovery's STS-131 mission to theInternational Space Station with Managing Editor Tariq Malik and Staff Writer Clara Moskowitz based in New York. Click here for shuttle missionupdates and a link to NASA TV.